Jaguar E-Space SUV has marked its name in Guinness World record books following an epic 15.3 metre-long jump with a 270-degree "barrel roll" rotation. On July 14th 2017, the British brand Jaquar owned by Indian Car maker gaint Tata revealed their E-Pace SUV which is a five-seat, spacious compact SUV with Sports car looks aiming the next generation of Jaguar customers. Jaguar disclosed their E-Pace, the crossover SUV in a vibrant way. 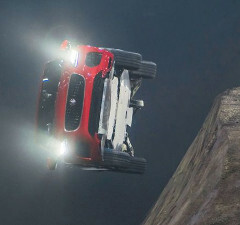 The legendary British stunt driver Terry Grant drove Jaguar E-Space and made a staggering 15.3 metre-long jump between ramps with a stunning 270-degree barrel roll. barrel roll is an aerobatic skill display in which an airplane makes helical rotations while moving forward maintaining its original direction. This act is usually done during airshows and military operations. E-Pace is Jaguar’s first compact but spacious SUV which is a unique combination of dynamic driving, comfort, agility and dazzling sporty look. For more details visit Jaquar E-Pace.